Could it be possible that clarified butter, or ghee could be good for you? Ghee is essentially butter that has been strained to have all the milk solids and water removed, leaving just the protein and fat. While this combination of protein and butterfat may sound unnerving, ghee is actually full of beneficial nutrients and contains a balance of short, medium and long chain fatty acids that help to enhance the absorption of nutrients and alkalize the blood. – Fighting Inflammation: Ghee has been shown to reduce the secretions of leukotrienes and prostaglandins, which both contribute to the formation of pain and swelling, due to the presence of omega-3 and omega-9 fatty acids. – Reducing Cholesterol: despite being fed misleading information about saturated fats and their role in heart disease, ghee has been found to reduce cholesterol due to the naturally occurring levels of conjugated linoleic acid (CLA). CLA has been shown to help boost the metabolism, increase muscle strength and endurance and reduce body fat. – Helping digestion: ghee is most commonly used in Ayurvedic remedies to strengthen and aid digestive health. In studies, ghee was found to increase the secretion of stomach acids which helped to digest and absorb food. Unlike butter, ghee contains no dairy so it does not upset those who are lactose intolerant. A traditional Ayurvedic remedy for constipation and to remove toxins includes ingesting a teaspoon of ghee in hot water at the start of each day to help flush out the digestive system. –Strengthening Immunity: the high concentration of butyric acid found naturally in ghee has been show to boost the immune system and is also believed to help fight off cancer cells. Ghee is also rich in antioxidants, Vitamin A, D, E and Vitamin K.
– Enhancing absorption: In Ayurvedic medicine, ghee has been said to help transport the medicinal properties of herbs, spices and nutrients to organs and cells for better absorption. Ghee is also said to enhance the flavor of spices used in Indian cuisine. – Boosting Memory: one of the most common Ayurvedic remedies for boosting your memory and helping with cognitive decline is eating ghee. It is said that ghee can enhance longevity and slow the ageing process. – Wound Healing: ghee has been shown to be effective at repairing and restoring the skin. It is also anti-viral which means its perfect for sterilizing cuts, scrapes and burns. – Strengthening the Aura: in Ayurvedic medicine it is believed that ghee has the ability to strength the aura and bring increased energy, libido and vitality to the body. 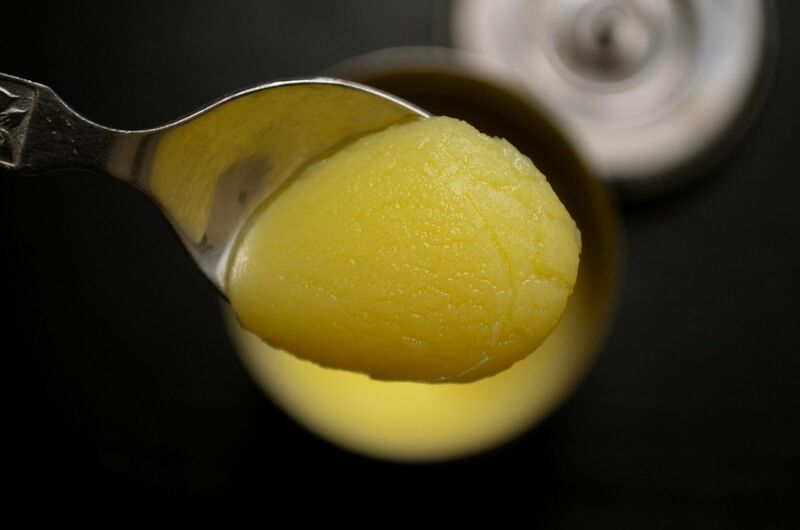 Ghee is also a perfect cooking medium as it can withstand temperatures of up to 485 F which means that unlike vegetable oils it will not turn rancid when heated. It also gives foods a mild, nutty flavor that compliments spices and savory seasonings. In order to get the best health benefits from ghee you need to make sure that it is organic and has been made from grass fed butter. This is very important as many commercially produced ghee products have been found to contain high levels of hydrogenated vegetable fat. If you can, try to find a ghee that has been made on the full moon. In Ayurvedic medicine the full moon is said to amplify the healing qualities and taste of the ghee.